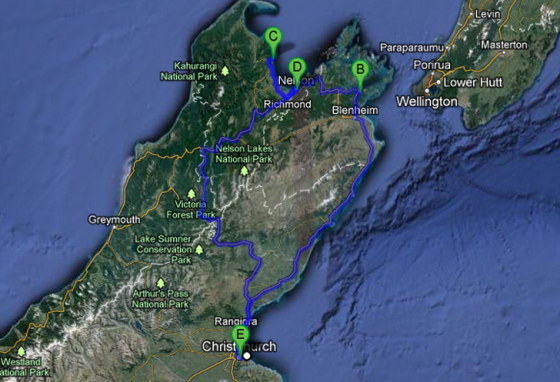 Road Trip to Picton and Nelson! A couple of weeks ago we enjoyed our first road trip. Labour Day here occurs on October 22, so we took advantage of our 3 day weekend with an action packed road trip. We started on Friday, immediately after work. We had a 4 hour drive ahead of us, but it was pretty stunning. For at least two of those hours we had the ocean on our right and mountains to our left. 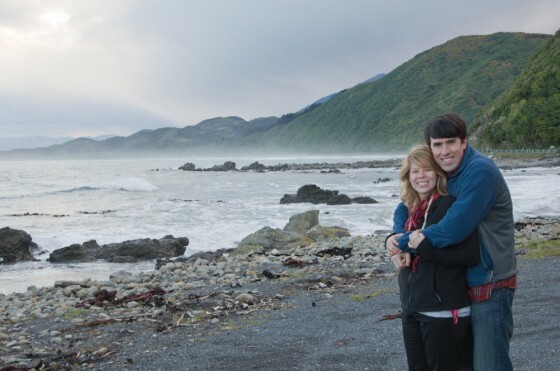 We stopped outside the city of Kaikoura and had a picnic on the beach. Kaikoura is famous for its seals and whale watching. We didn’t spot any whales (you typically need to be in a boat) but we did spot a couple seals waving as we drove up the coast. I (Evan) did have a major loss of innocence moment, however, and received my first speeding ticket ever! Cars here don’t have cruise control, and it is hard to watch your speedometer while gazing at the mountains and ocean. Needless to say, I had my foot on the gas for a bit too long and was busted. But, we couldn’t let that ruin the trip! So onward we went along the coast, and then through the hills and vineyards of wine country. Our first night we stayed in Picton, a small harbour town on the North part of the South Island. 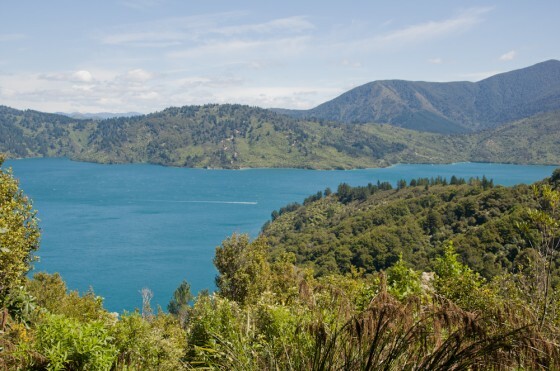 There is a ferry boat that goes between Picton and Wellington, which is a city on the South Island. 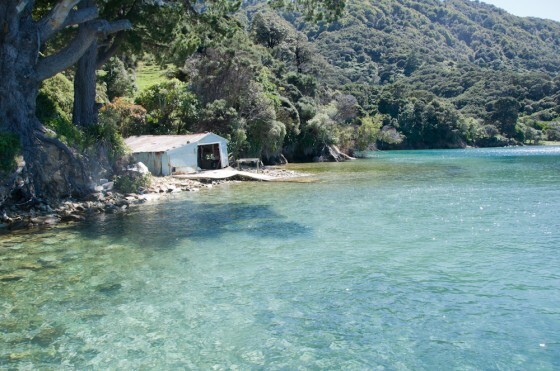 More importantly for us, it is home to the Queen Charlotte Track in the Marlborough Sounds. 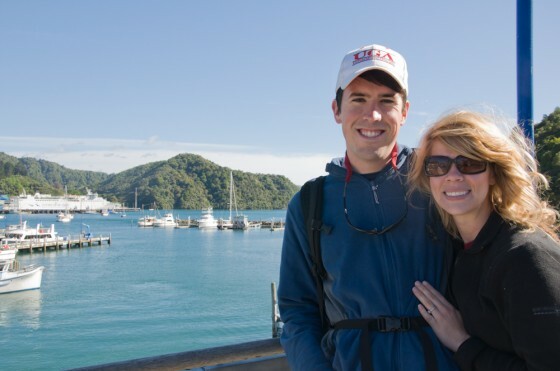 We hopped a ferry boat that took us on a 2 hour ride to the end of the Queen Charlotte track. The whole thing is 71km, so naturally we couldn’t do the whole thing in a day. The boat dropped us off, and we had a 10km hike through the sounds to our pick-up location at Furneaux lodge. We had about 3.5 hours for what was supposed to be a 2.5 hour walk. Since we had some extra time on our hands, we took it easy. 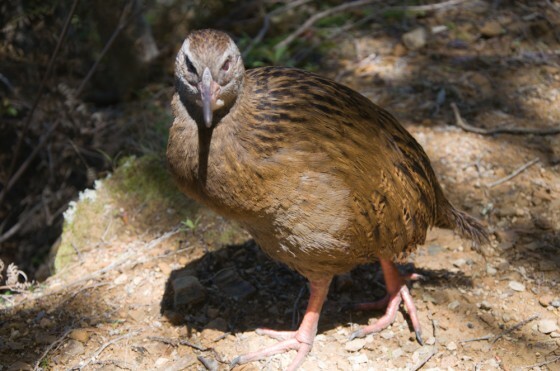 We stopped and met some native New Zealand Birds, called Wekas. We enjoyed some incredible views, and took several pictures. We stopped and had a picnic with a fantastic look over the blue and green water. 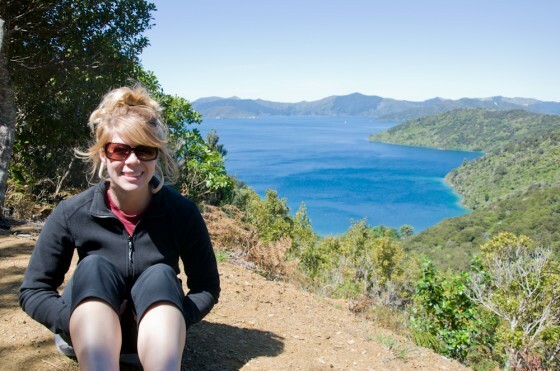 The Marlborough Sounds are filled with countless bays, it was quite remarkable. Our boat was scheduled to pick us up at 3pm. Around 2:45 we were still walking, but we figured we had to be pretty close. At 2:55, we were starting to get pretty nervous. At 2:56, we saw a sign informing us that Furneaux Lodge was another 25 minutes walk! It was difficult for us out-of-shape people to run up and down hills with bags on our shoulders after walking 9km, but we made it to the lodge by 3:05. Our boat, of course, didn’t arrive until 3:25 anyway, so our run was pretty useless. But the prospect of being stuck in the middle of nowhere did make things a bit more adventurous. When we got back to Picton, we drove to our next destination: Nelson. 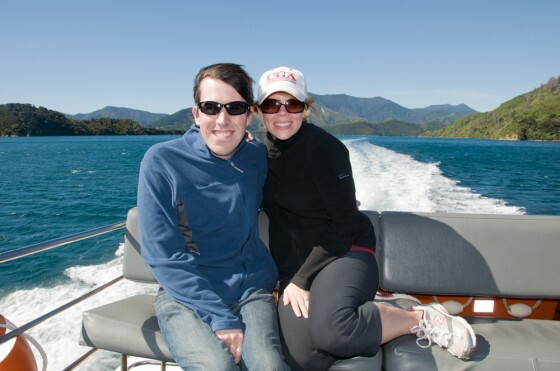 We took the scenic route and enjoyed many more incredible views of the Sounds. We both decided we wanted to return someday, but next time we’ll ride bikes and do the entire 71km. We arrived to Nelson in time to make dinner and collapse in bed asleep. 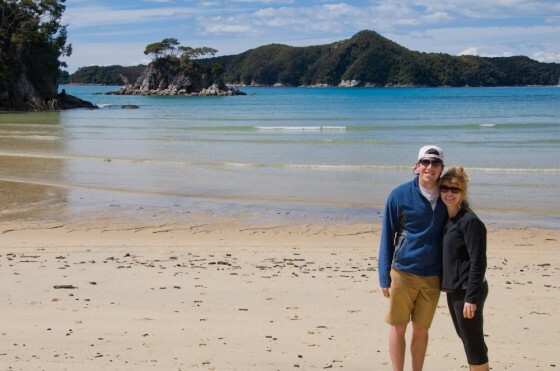 The next morning we headed out for another day hike, this time to Abel Tasman National Park. 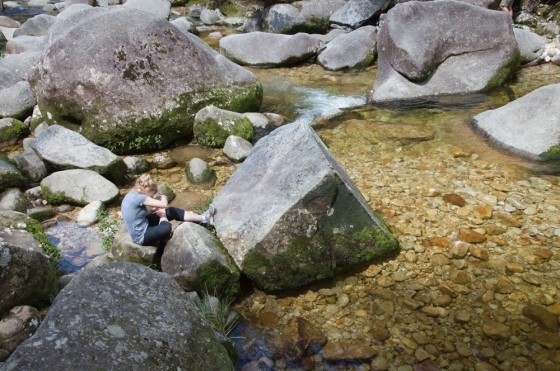 Like the Queen Charlotte Track, Abel Tasman is too long to do in a day. The entire trail is 54km, and so we only hiked a small portion of it. Once again we hopped on a boat and headed up the coast. We landed in a beautiful beach and had to get knee deep in the water to make it to shore. Spring has only just begun, so the water was chilly, but it was such an incredible beach we didn’t care. The sand there is golden because of the way the rocks in the area rust. The water is very turquoise and clear. We had a 13km hike ahead of us, but our ending point was actually our car. Since we didn’t have a ferry boat to rush to to catch, we once again decided to take our time. Our first 45 minutes were spent lounging on the beach. We began our walk and were amazed at how diverse the foliage was. It felt like we were walking in a rainforest and the entire trail bordered these incredibly clear lagoons. We took a little detour to Cleopatra’s pool, which was a nice waterfall in a beautiful river. We stopped for lunch, took pictures, and went slow. After all, we had 7 hours to walk 2.5 km longer than we walked the day before in 3.5 hours. After about 4 hours we came to our first sign, which informed us that we had 13km to go…which was quite a shock because we thought our entire journey was 13km. Needless to say, there was some miscommunication somewhere along the line, and we actually signed up for an 18km journey. From that point on, we had to move a bit faster. No more detours or aimless lounging on the beach! We still enjoyed the scenery, however. 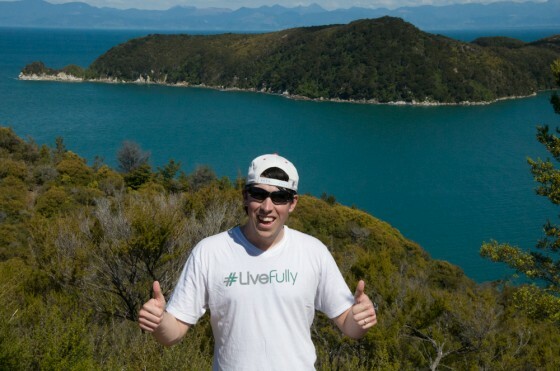 What makes Abel Tasman so fascinating is the diversity. One minute your on the beach, and the next your in a rainforest, and then you go up to the top of a hill and the landscape suddenly feels like the desert, then you go down a hill through a rainforest and end up in marshlands! By journey’s end, our legs were exhausted. Somewhere in the last 5km, our legs went on autopilot. If we stopped moving, we may not have been able to start back again. Our brains were too tired to communicate with them, so our legs just kept moving. We made it back to our car around 7:30 pm, in time to drive back to Nelson, eat dinner, and collapse asleep again. Our final day meant a journey back home to Christchurch. 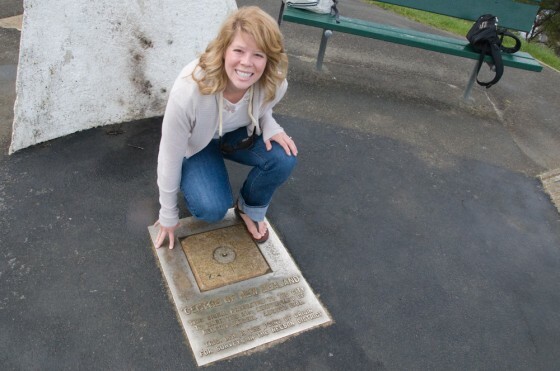 Before taking off, we made a quick detour to the very center of New Zealand. It was a “short” hike up a “hill” that ended up taking an hour to get up and down again. We even had a bit of rain on the way up, but fortunately it cleared by the time we reached the top. Instead of going home along the coast, we cut down through the center of the island. 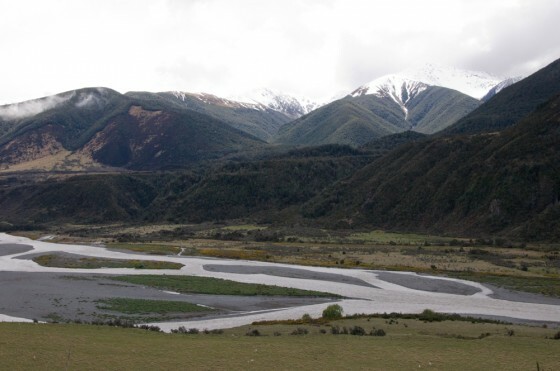 There was a fair amount of rain, but the skies cleared up a few times for us to see the snow-capped mountains of Lewis Pass. I was hoping to get some fly fishing in, but alas, the rivers were far too swollen with rain. If I ever get my act together, I’ll edit a highlight video from our trip as well. Woot!